With Fallkniven’s Tre Kronor series, you know that you have a product of excellent quality which is refined in all departments. 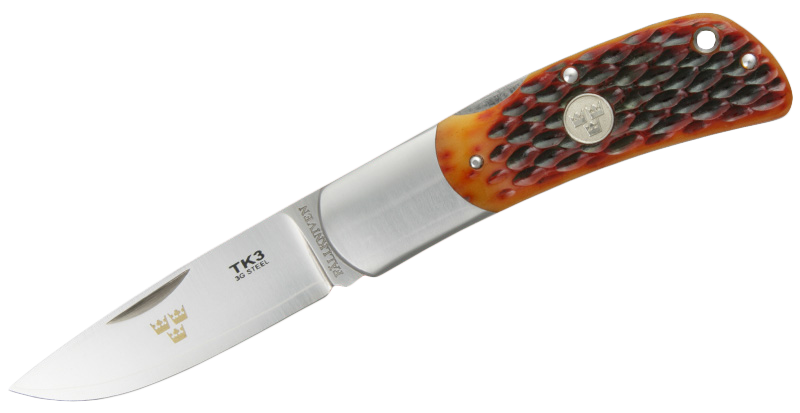 The TK3jb has a handle which is made from jigged bone which is a curious feature for a knife handle but which offers a unique feel and a rather special texture to this revolutionary pocket knife. The TK3jb also has quite a stout blade shape which makes it an excellent cutting tool all round thus it is also useful for everyday use. Additionally the curved tip makes the knife ideal for cutting both in curves as well as in straight lines. 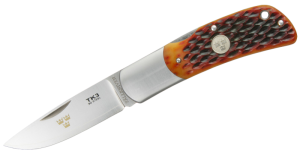 As with the other folding knives in the Tre Kronor series, the TK3jb can be described as lightweight, beautiful and extremely safe. The 3G steel is quite revolutionary in that it consists of a core which is made of the Super Gold Power Steel or SGPS flanked by both sides of VG2 laminated anticorrosive steel. As with other TK knives the TK3jb is the result of a painstaking and intense refinement process which focuses on the functional concept of the folding knife. The blade definitely represents the best option on the market today for folding knives and the locking mechanism is something to marvel at. With each and every knife in the Tre Kronor series manufactured by hand, the TK3jb guarantees the fact that no single knife is the same. The material for the handle which is a specially made jigged bone is a classic and is actually made from Highland cattle who roam about as free as nature intended them to be in the countryside. The handle is immensely strong and will last a lifetime but apart from that it is very beautiful to behold. The TK3jb also comes with a classic Black Cordura pouch which stores it to maximum effect.